Solar power continues to become an increasingly popular and reliable form of renewable energy. The development of this new technology has made converting the sun’s energy even more accessible and affordable. In this article, we’ll take a closer look at the unique features of solar shingles, some benefits and drawbacks of using these tiles, and the top brands currently (and soon to be) on the market. Solar shingles are designed to mimic the look of traditional roof tiles. The thin photovoltaic (PV) sheets are made to either replace or lay on top of current shingles. Solar roof tiles act just like solar panels by capturing and converting energy from sunlight. Additionally, they can be installed in any type of climate or environment. Shape and Size: Solar shingles measure smaller than traditional solar panels. They are, however, similarly sized to traditional roofing shingles at about 12 inches wide and 86 inches long. The shingles weigh approximately 13 pounds per square foot and are usually less than one inch thick. Standard installation requires about 350 shingle tiles. Materials: Solar shingles are typically made from one of two types of materials. Copper indium gallium selenide cells are thin and flexible and are thought to have one of the highest conversion efficiency rates at 10-12%. Monocrystalline silicon (mono-Si) is a natural semiconductor typically used to make computer chips. The tiles have an average efficiency rate of 15–20%, but are generally more expensive. Power Generated: The amount of power generated by solar shingles will vary depending on the type of shingle you install. Shingles usually produce somewhere between 13 and 63 watts. A typical residential cluster of 350 shingles can reportedly reduce an average household utility bill by 40 to 60%. It should be noted that an energy inverter kit is required in conjunction with the tiles to harness the power that is collected. Most people decide to install solar shingles in an effort to help conserve the planet or reduce their monthly energy bill. There are some other important benefits and drawbacks to consider as well before purchasing PV sheets. Appearance: Solar shingles, with their sleek design, tend to be more aesthetically pleasing than traditional solar panels. Shingles, unlike panels, blend into rooftops to create a more level appearance. On the other hand, solar shingles do have a metallic appearance. The contrast of metal cells atop a traditional roof may be off-putting to some homeowners. 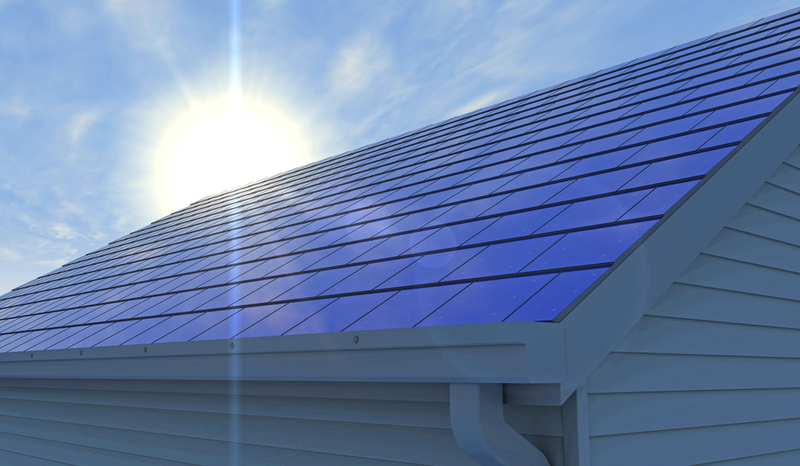 Efficiency: Solar shingles can lower electricity bills by approximately 40-60% per month. Additionally, homeowners who install Energy Star-approved solar power systems may be able to defray installation costs via tax credits. On the other hand, solar shingles may actually be less efficient than panels. Particularly, the angle of solar panels can be adjusted for the best sunlight exposure while shingles cannot. What that means for homeowners is more shingles might be needed to get the same energy output. Installation: Solar shingles are typically easier to install than solar panels. Regular roofers can likely complete most of the work without the help of solar professionals. On the other hand, arguably the biggest drawback of solar shingles is the high cost. A large installation can cost a homeowner between $10,000 to $20,000. There are currently three top brands producing solar shingles. GAF, North America’s largest manufacturer of commercial and residential roofing, has recently introduced their contribution to the solar market with the DecoTech system. They offer a low profile design that is integrated into existing roofing systems. CertainTeed is known for their construction of sustainable structures. The company manufactures resilient Apollo II solar roof tiles that can with withstand 250 pounds of pressure per square foot as well as 150 mile per hour winds. Tesla is looking to become another powerful player in the market. As of May, Elon Musk’s company is accepting preorders for their new line of solar shingles. There are two styles available, smooth and textured black glass. Purchasers can calculate the amount of tiles needed as well as the potential costs via online calculators. The estimated cost per square foot is $42 and delivery is expected later this year. A solar shingle system may not be the right choice for all homeowners, but there are undoubtedly advantages to investing in these innovative tiles. These materials can not only help save the planet, but also be a wise investment.